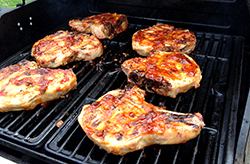 Grilled pork chops definitely fit in with the classics, and at many houses they’re the absolute favorite meal from the grill The smoky pork taste combined with the caramelized sweet-sticky barbecue sauce is an awesome combination, and when you make the sauce from scratch, it really takes it to the next level. Potato salad and corn on the cob are prefect backyard dinner partners. 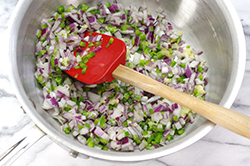 TO MAKE THE SAUCE: Heat the vegetable oil in a medium saucepan over medium heat Add the onion, garlic, and jalapeño and mix well. Cook for about 5 minutes, until the onion is soft. 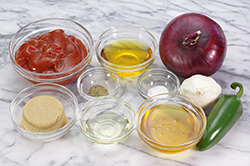 Add 1/4 cup/60 ml water, the ketchup, vinegar, honey, brown sugar, salt, and pepper. Mix well. Bring the sauce to a low simmer. 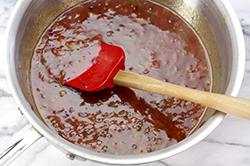 Reduce the heat, cover, and cook for about 15 minutes, stirring occasionally, until the sauce begins to thicken. Remove it from the heat and set aside. Prepare an outdoor grill to cook direct over medium heat. Season the chops with salt, pepper, and paprika. Place them directly on the cooking grate and cook for 3 to 4 minutes, until golden brown. 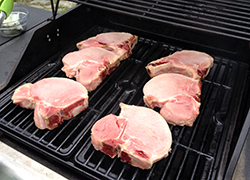 Flip the chops and brush the top with a heavy coat of the barbecue sauce. Cook for another 3 to 4 minutes, until golden brown on the bottom. 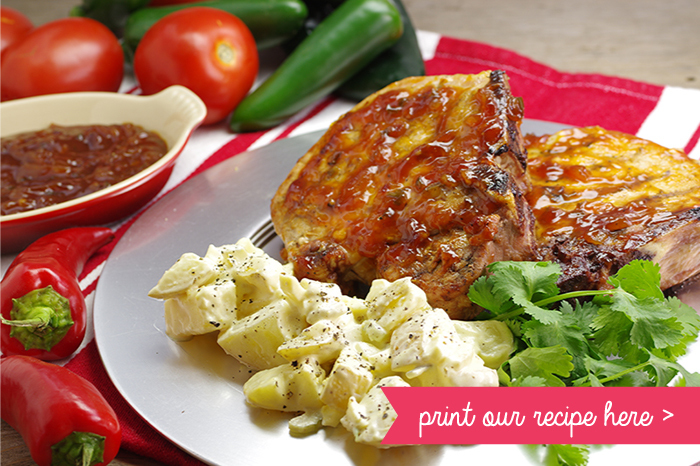 Flip the chops and brush the top with a heavy coat of sauce. 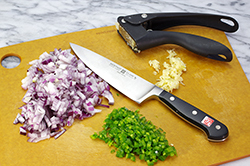 Continue cooking, flipping, and brushing with sauce about every 2 minutes, until the sauce is cooked on the chops and they have reached an internal temperature of 150°F/65°C. Transfer the chops to a platter to rest for 5 minutes before serving.